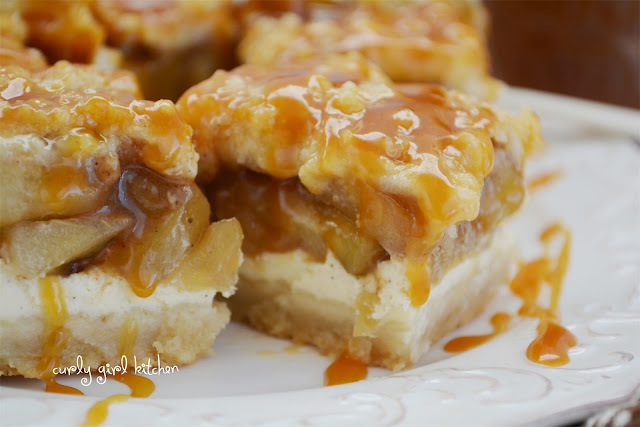 I remember begging my mom to let us make caramel apples, and thinking that there was nothing more wonderful than taking that first bite of a cold, tart crunchy apple, covered in sticky sweet caramel, dipped in nuts or candy. 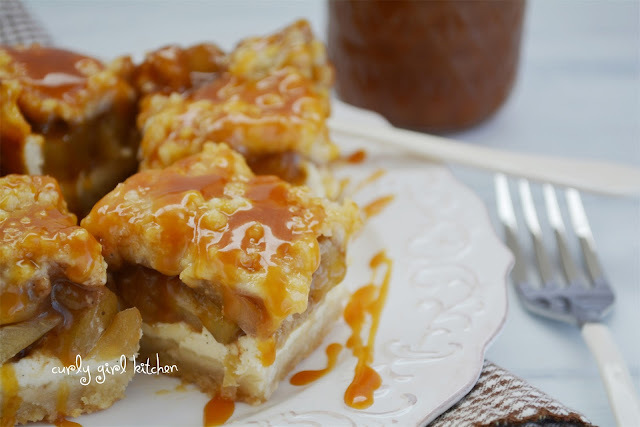 They were usually too big to finish, and afterwards the kitchen table would be covered in a sweet and sticky mess of half-eaten apples, crushed nuts and caramel wrappers. And of course, three sweet and sticky, but very happy children. 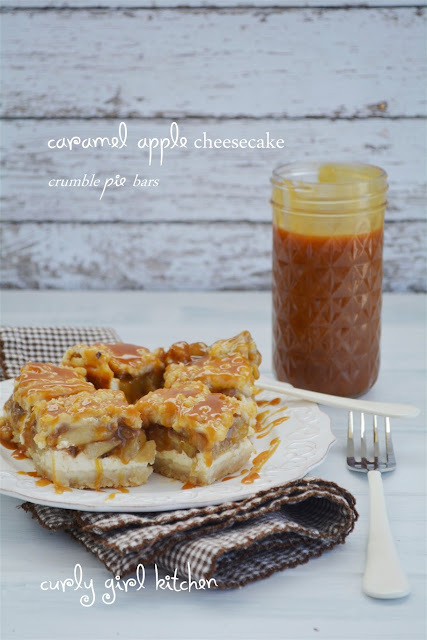 I haven't made caramel apples at any point in my adult life - maybe it's that the idea of them now is more appealing than the actual treat - but I do still love any combination of caramel and apples in the fall. 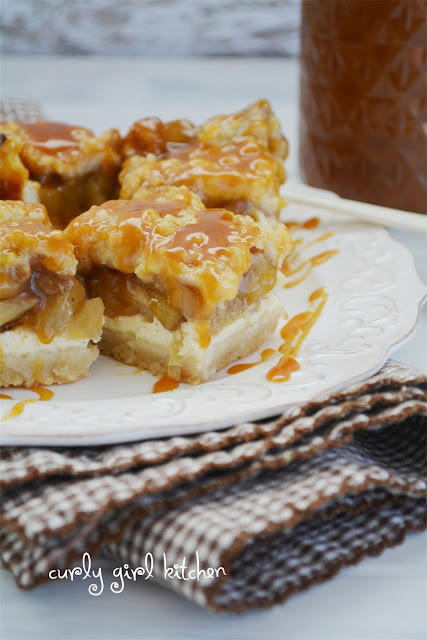 So for my caramel and apple craving, I baked a big pan of these pie bars with a buttery shortbread crust, tart apples cooked with brown sugar and plenty of spices, a layer of cheesecake and crumble topping. 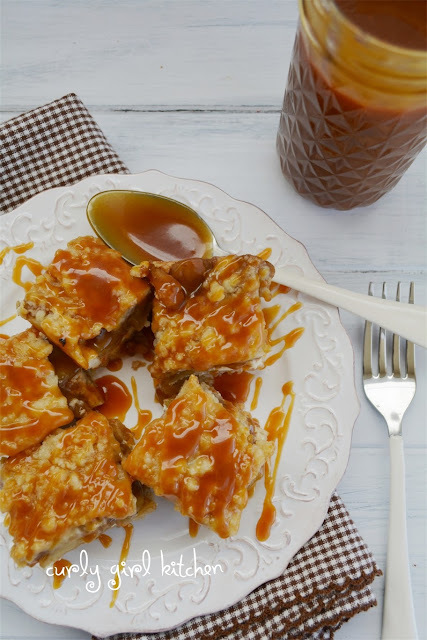 All drizzled with homemade salted caramel sauce. Note, although pictured here, the cream cheese filling is on top of the apples, I've switched those layers in my instructions below as they bake better layered with crust, apples, cream cheese, then topping. In a large saucepan, combine the apples, lemon juice, sugar and spices. Simmer over medium low heat until juicy and the apples have softened, about 30-40 minutes. In a small bowl, whisk together the flour and water to create a slurry. Add to the apple mixture and simmer for 5-10 more minutes until the juices have thickened. Let cool slightly. In your food processor, combine the crust/topping ingredients until pea-sized pieces of butter remain. Reserve two cups of the crumbs for the topping, and press the remainder of the crumbs firmly against the bottom of the baking dish. (The crumb mixture will seem very dry, but it will bake into a shortbread cookie-like crust.) Bake crust for 15 minutes. Meanwhile, beat the cream cheese, sour cream, eggs and vanilla bean paste until smooth and creamy. Spread the apples over the hot crust, then pour the cream cheese filling over the apples. Bake for 15 minutes, then sprinkle the crumb topping over and bake for another 20-25 minutes until golden brown. 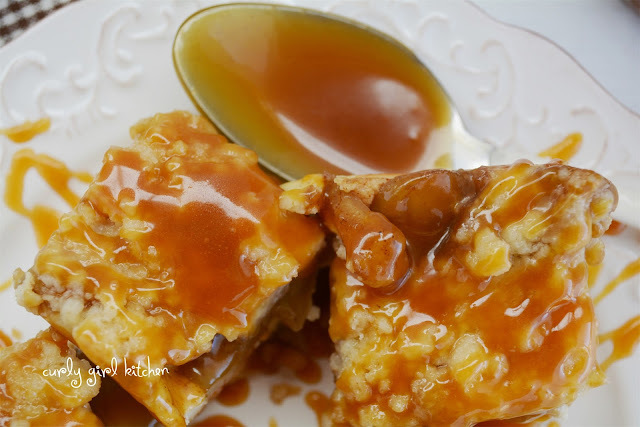 While the bars are cooling, make the caramel. 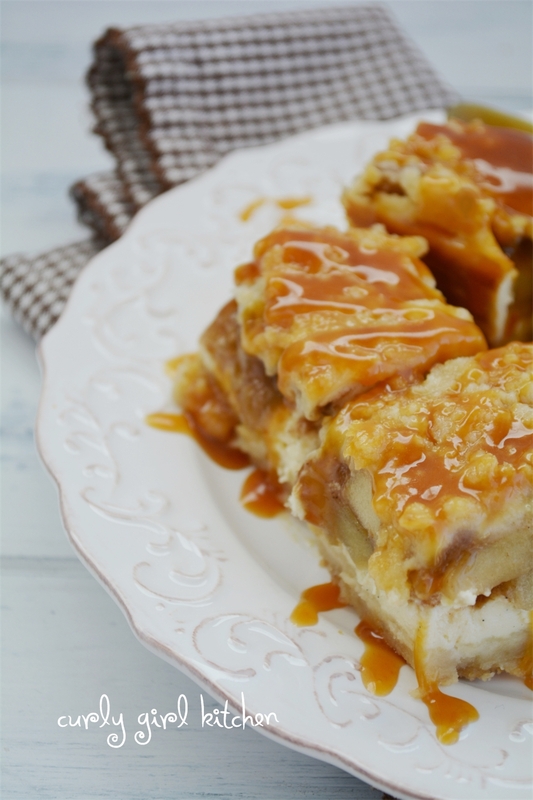 Cool bars completely before cutting into squares, and serve with the caramel sauce. I tried different recipes for caramel sauce or butterscotch sauce last time. Therefore I'm happy to find this useful recipe for pie bars. So I know whereover I should pour my experimental sauces. 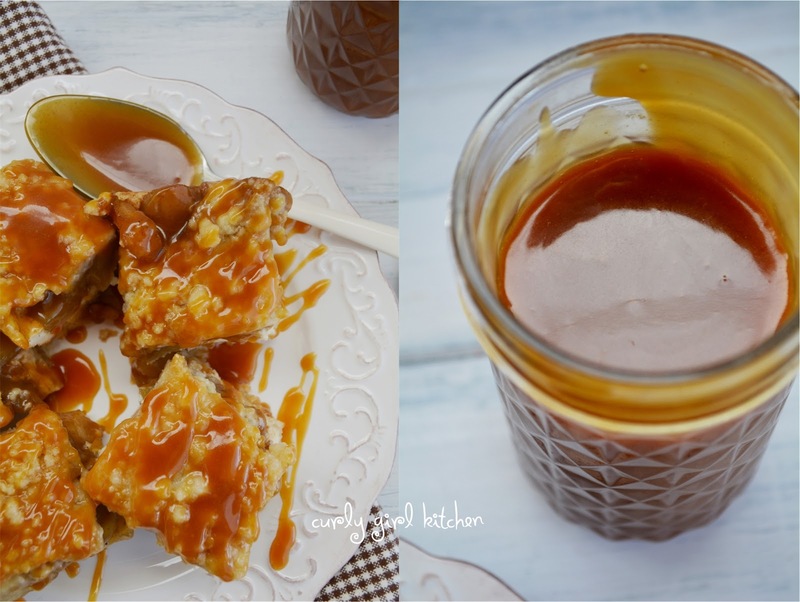 Your photos look sooo mouth-watering that I think I'm going to treat me with a spoonful of caramel sauce at once. Thank you for the inspiration!